Sergey Khvoshchinsky composer, was born in 1957 in Minsk, Belarus. He graduated as a composer from Belarusian State Conservatory (class of Professor Dmitry Smolsky). He moved to the United States in 2000, and currently lives in Minneapolis. Mr. Khvoshchinsky is the author of many works composed in various genres and styles. His music features singable melody and simple harmony, varieties of rhythms, and clarity of form. His orchestra and choir scores are rich with color and powerful sound. Among his compositions are a Symphony for Symphonic Orchestra; a Choral Symphony; a Concerto for Accordion and Symphonic Orchestra; two ballets; scores for dances; music for orchestra and band; suites for accordion, woodwind instruments, violin, piano; arrangements of sacred hymns; songs and arrangements of folk tunes; and music for solo instruments. While in the USA he has been very active in the field of choral music, collaborating with many choirs in America and Europe. 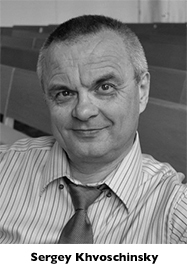 Mr. Khvoshchinsky is a winner of four International and American composers’ competitions. Among them are the Dallas Wind Symphony contest for new Fanfares (2006), the Faith Partners Program of the American Composers Forum (2005), the VocalEssence contest “Welcome Christmas” for a new Christmas carol (2001), and Boston Metro Opera’s International Contemporary Americana Festival (2010). He is also the winner of a Soviet Union competition for the symphonic poem “Khatyn” (Moscow 1985). In 2000, Khvoshchinsky received a commission for the Belarusian Rhythmic Gymnastics Team for the Olympic Games in Sydney, Australia, in which they took second place. Some of Khvoshchinsky’s compositions have received international recognition. His compositions and arrangements of folk music have been performed in most countries of the world by Belarusian and local groups as well. Among them are world-recognized groups such as The Rose Ensemble from the United States (a winner of the International Choir Festival in Tolosa, Spain, 2007); the Choir of Stellenbosch University, South Africa (a winner of the World Choir Games in China in 2010); Enchiriadis, a women’s vocal group from Spain (Gran Premio Nacional de Canto Coral, 2010); and many others. In other years, Khvoshchinsky taught at Minsk Musical College (accordion performance) and Belarusian University of Culture (music theory and contemporary music arrangement). In 1995, the composer founded the Chamber Ensemble, whose concert program was based on his arrangements of Renaissance, classical, sacred, and popular music. Currently, Mr. Khvoshchinsky works at Episcopal Church of the Holy Apostles in St. Paul, Minnesota, and composes music, receiving commissions from around the United States and across the world. As an arranger, Khvoshchinsky collaborates with many churches in the United States.